The ambitious animated short is written and directed by Vincent Gallagher and produced by Damian Farrell. ‘Second To None’ tells the story of Frederick Butterfield, a failed inventor who has always played second fiddle to his mere one minute older twin brother Herman. When Herman becomes the world’s oldest man, Frederick finally sees his opportunity to be first place. He’ll just have to get rid of his brother to do it. 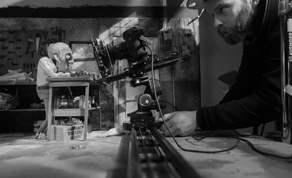 The film enjoyed its world at the 2016 Galway Film Fleadh where it picked up both the James Horgan Award for Best Animated Short and the Don Quijote Award for Best Animation. The former is Academy Award Qualifying, which sees Second To None in consideration for the 2017 Oscars in the short film (animated) category. Vincent's other film ‘Love is a Sting’, written by Oscar winner Benjamin Cleary (Stutterer) is also in consideration for the 2017 Oscars in the short film (live action) category after winning the Grad Prix at the 2015 Cork Film Festival. This project was also nominated in the Short Film category at the 2016 IFTA Film & Drama Awards. 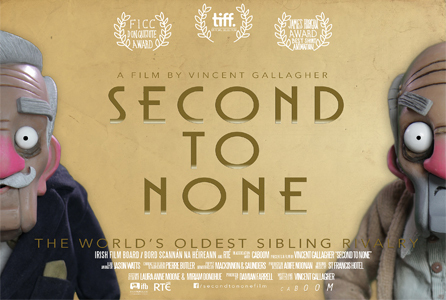 Second to None was produced with the support of RTÉ and the Irish Film Board.